Arsenal legend, Thierry Henry, has criticized members of the current squad, for not celebrating with Alexis Sanchez, when he scored against Crystal Palace on Thursday. 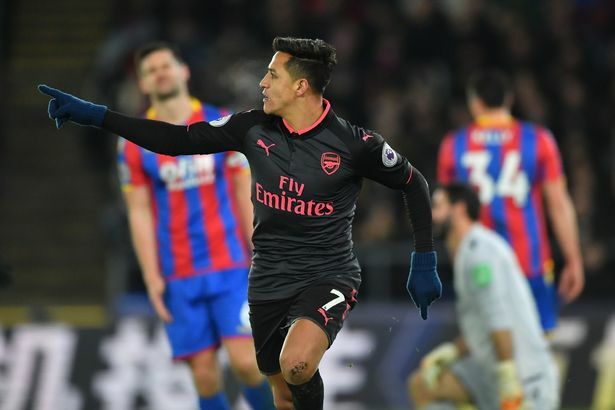 Sanchez, who is continuously linked with an exit from the club, netted twice at Selhurst Park, as the Gunners won 3-2. The Chilean put Arsenal back in front against Palace after neat link-up play with Alexandre Lacazette, but was only congratulated by a handful of his teammates. He was then see gesturing to those who didn’t join him in the celebrations. “You’re not here for Alexis Sanchez, you’re here for Arsenal. Arsenal scored. Go and celebrate. Whoever does it, we don’t care about that, go and celebrate with your team-mate.